Many Palestinians, accompanied by Israeli and international peace activists, marched in solidarity with the hunger striking detainees in Israeli prisons, during the weekly nonviolent protest against the Annexation Wall and colonies, and called for more solidarity with the detainees. 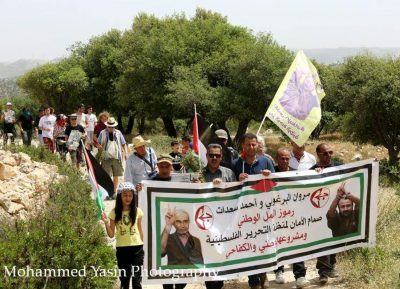 The protesters marched from the center of the village, and headed towards the villages’ orchards, largely isolated behind the wall, while chanting for liberty, steadfastness and ongoing support to the detainees, facing escalating Israeli violations. They carried Palestinian flags, and posters of hunger striking detainees, including detained legislators and leaders Marwan Barghouthi and Ahmad Sa’adat, and called for the release of all detainees from Israeli jails. 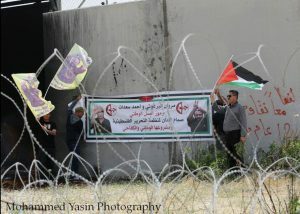 The protest this week also marks April 17th, the Palestinian Prisoners’ Day. Popular Committee coordinator, Abdullah Abu Rahma, called for ongoing resistance and activities, in support of the detainees and their legitimate demands. In related news, the soldiers attacked the weekly protest in Kufur Qaddoum village, in the northern West Bank governorate of Qalqilia, shot and mildly injured eight Palestinians, including a journalist and an Israeli peace activist.